Visual Studio Code>Snippets>CodeHeaderNew to Visual Studio Code? Get it now. An extension for quickly insert header comment. An header comment extension for vscode. 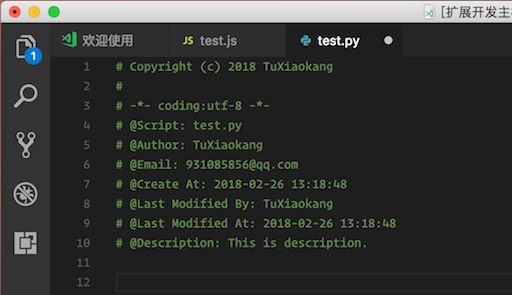 An header comment extension for vscode, and supports automatic update file modification time. Tip: shift+alt+i You can insert comments in the head, ctrl+s After you save the file, and automatically update the time and author. codeheader.author: Your name, it will be set to git user.name if not provided. codeheader.email: Your email address, it will be set to git user.email if not provided. codeheader.copyrightOwner: Your copyright owner, it will be set to codeheader.author if not provided. fix error format when not use copyright. 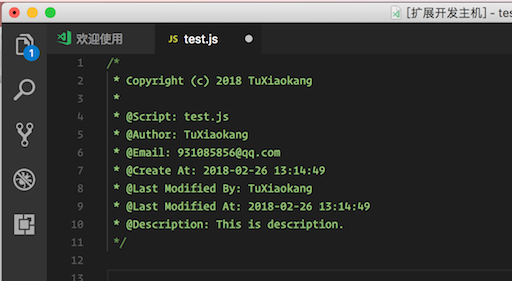 update the format of js comment.